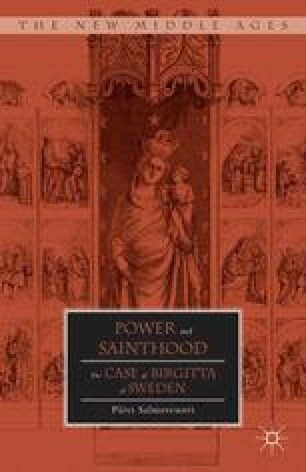 In scholarship on Birgitta, the death of Birgitta’s husband, Ulf Gudmarsson, in 1344, has often been seen as the birth of the visionary Birgitta. To take one example, Bridget Morris writes, “In many ways Ulf’s death came as a relief to Birgitta, as a release from earthly pressures and pleasures towards which she was always tempted, either by natural instinct or conjugal duty.”1 I completely agree with Morris that Ulf’s death seemed to be a relief to Birgitta and enabled her to live more freely. However, she did not completely leave “the earthly pressures” behind her. On the contrary, her activities among the politicians, for example, were only beginning. She was now free to follow her hagiographic role models and ready to carve out a model of her own. She had been having visions and revelations for years and struggled to live a saintly life as a married woman but now she was ready for the transformation from the wife of Ulf Gudmarsson to the bride of Christ.